This book is a powerful tapestry of Scholarship, Activism and Poetry. The Personal with the Political gives this book balance and magnetism! During the time when key leaders of the Black Panther Party were assassinated by FBI operatives while asleep in their beds, Jalil Muntaqim, a new member of the BPP, was arrested just before his 20th birthday. Incarcerated in California and New York for the past 47 years, Muntaqim’s essays and poetry in ESCAPING THE PRISM are a living testimony to one man’s creativity, resilience and commitment to justice for himself, and all political prisoners in our “so called” Democracy. demanding you to live life fully and love completely…. so your heart will hear my poetry tantalizing your soul…. I call you when my nights are void of the moon. and the only solace I can find is knowing you are there. I call you LOVE because you represent my own heart, blood, and soul. His essays invite us—demand us—to act, by giving the reader economic facts that support his and other scholars’ conclusion that the Prison Industrial Complex (PIC) is a big and profitable business in our nation. He shows us in detail how the Corrections Corporation of America (CCA), owner of most US private profit-making prisons, sells shares on the New York Stock Exchange, and therefore “benefits financially from harsh criminal justice polices.” In other words, more humane policies toward non-violent prisoners, which include recent immigrants, would cut into the profits of the PIC. Therefore, the CCA is about corporate profit not public safety or rehabilitation. Jalil’s scholarship translates into his activist call to us on the outside to publicly demand divestment from corporations who financially benefit from inhuman prison policies—i.e., solitary confinement torture. In his chapter, “When Food Becomes a Weapon,” Jalil validates the Pelican Bay PRISON HUNGER STRIKERS of California, whose anti-racist and nutritional demands got public attention and support. You feel righteous indignation in his writings, as well as his love for Freedom and the Beloved Community that he has dedicated his life to. His essay dedicated to “Mothers who have lost a child from an unjustified police shooting” is a powerful indictment of law enforcement in our country. It sheds light on “the presumption of immunity” for police, and decries the militarization of our policing institutions, clearly supporting the growing Black Lives Matter Movement in our nation. Some of his poetry is intimate and personal about women he loves deeply. His descriptions of their sexual pleasures are beautiful to read. The depth and breadth of Jalil’s book demonstrates his brilliance, his lived experiences, his personal, historical, social, emotional and political understanding of the decades of oppressive and racist behaviors of the mainly white men in certain positions of political power. He exposes policies that have destroyed the lives of thousands of our fellow citizens—especially low income people of color. As a lifelong educator/activist myself, I hope that this book can become required reading in high schools, community colleges and universities, especially in interdisciplinary courses that address psychological, sociological, historical and political issues pertaining to family and community, law and order, democracy and freedom. As our nation continues to grapple with racism and inequality still, this REMARKABLE collection is truly a testament to the vision and integrity of Jalil Muntaqim—a dedicated scholar, unrelenting activist, and fearless freedom fighter. Book Review by Phyllis Taub Greenleaf, M.Ed, Harvard School of Education. 1969. Lifelong activist and former community college teacher of child development. 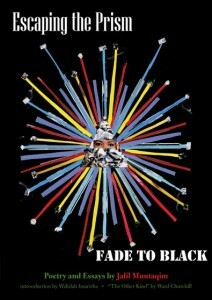 Escaping the Prism Fade to Black is published by Kersplebedeb Publishing; to order your copy, visit leftwingbooks.net or AK Press or Amazon.